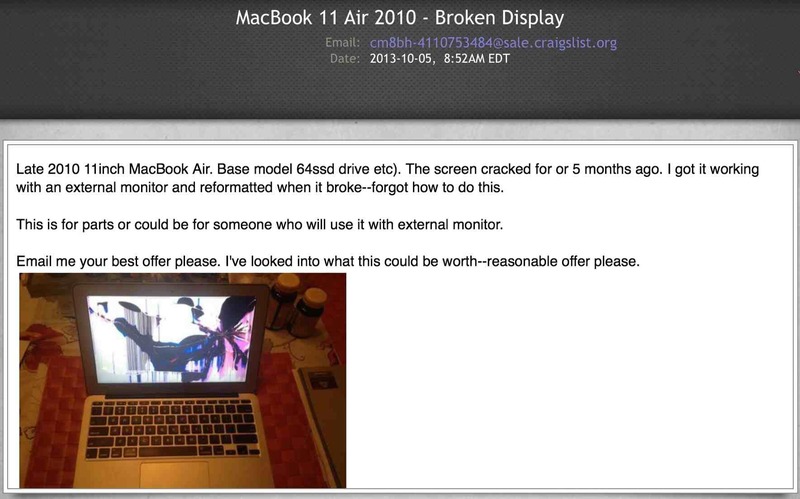 Value of Cracked Display on MacBook Air. Trying to sell it to someone. Discussion in 'MacBook Air' started by sapsjr, Oct 5, 2013. The display is cracked on my 2010 MacBook Air 11 inch 32Gb (low end). It seems it will cost around $300 to fix. Seeing as I paid $1000 for this 2-3 years ago It doesn't seem like a good idea. How much can I expect to sell it as is? I posted a Craigslist add this morning to see what offers I would get and the highest one so far is a measly $100. I am in a financial crunch. See screenshot of add for more info. I definitely would not pay any more than $100 for that. But that's just me. It can't possibly be that hard to find a replacement screen for 1-200 on ebay, fix it yourself, and sell it for a good 500 or more? A MacBook with a broken screen is exactly the same as a Mac Mini. You just keep the lid shut, buy a keyboard and mouse and plug in a monitor. Yours is not the most powerful one, but it should be a fine desktop computer for someone. I haven't used it in months. Yes it works in clamshell mode. I just can't for the life of me figure out how I did it. Could try booting from CD I supposed. I think I'd let it go at $200 minimum. Anyone else thinks that's fair? If no one buys in on craigslist by October than I will give ebay a shot. I would buy it for $100 this second and fix it to resell. This is one of the times you just list it on ebay and see what it goes for. Sometimes noobs pay way too much for things (like a iPhone 4 Verizon I sold right after iOS7 came out, went for $175). It should at that point stay on and work with the external monitor.